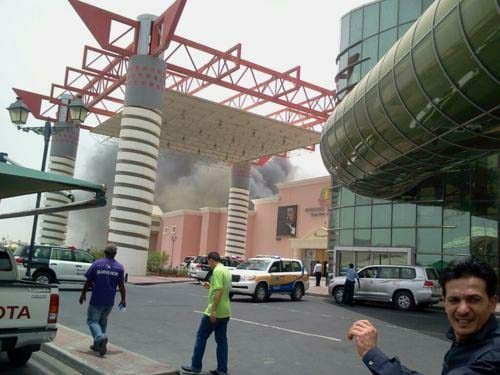 A fire broke out at the Villaggio Mall around 11am on Monday morning, according to witnesses. Details are still coming out, and the extent of the damage is still unclear, but by the time it was brought under control at 1:30pm, 19 people had died, mostly children. Here is the latest we have on the blaze. Follow the latest from Day 2 of our coverage. This concludes our live updates of the Villaggio fire story. Thank you to all our readers who kept with us today, sharing updates, photos, contacts and far more. New Zealand’s prime minister has confirmed that a set of Kiwi triplets, who were two years old, were among the children who died at Villaggio. “It’s a great tragedy,” PM John Kelly said. The grandparents are reportedly on their way to Doha. Doha-based cartoonist Khalid Al Baih drew this cartoon as a prayer to the deceased. A Catholic mass will be held for some of the dead tomorrow at the church at 6 pm. That brings the total number of vigils announced so far to three. There will be one at Aspire tomorrow at 5pm and one at the Pearl at 8pm. We are hearing unconfirmed reports that the top two managers of Villaggio have been arrested and will go to court, possibly facing charges tomorrow morning. According to media reports, New Zealanders and a French child are also among the dead. We are also working to compile a list of those killed and their stories. Please get in touch with us (editor (at) dohanews.co) if you can help. Twitter users have been expressing their regret at the loss of life today using the tags #OneCommunityDoha, #OneUnitedQatar and #RIPVillaggioFireVictims. Two vigils are being organized for tomorrow evening – one will be at Aspire Park at 5pm, the other will be at the Pearl-Qatar at 8pm. Qatar’s Minister of Interior, meanwhile, has declared that a high-level committee will be established to review building safety requirements. Reuters news agency is also reporting that four of those killed today were Spanish nationals, according to its diplomatic sources in Madrid. The press conference is over. No mall representatives were present to answer any questions, but officials have said that firefighters’ efforts were initially thwarted by the heavy smoke and heat. 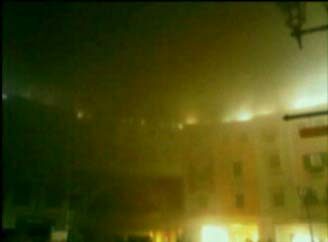 They also said that rescue teams initially did not know that those trapped inside the mall were children. Additionally, a lack of clear floor plans, visible emergency exits and a false alarm from the day before inhibited efforts to save those inside. For a good recap of the conference, also see ILoveQatar.net’s Q&A. Officials say no list of casualties will be offered as “there is no added value,” but that nationalities of those killed included “Europeans, Japanese, Spanish and others.” We’ve also seen reports that a South African child was amongst the dead. 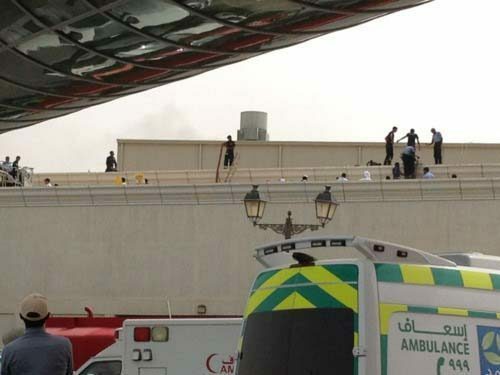 When Al Jazeera English reporter Stefanie Dekker asked if it was true that alarms and sprinklers didn’t work in the mall, the response was that some malfunctioned, and the cause of that is being investigated. 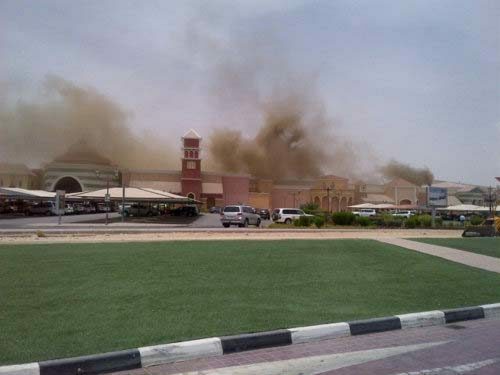 As for how long Villaggio Mall will be closed, Doha News was told that they still don’t know, as damages and reasons behind the fire are still being investigated. A little more detail on the deaths. Of the 13 children killed, seven were girls and six were boys. The fire reportedly started in Gympanzee, the children’s nursery at the mall, but isn’t clear what set it off. Ambulances reportedly arrived at the scene in only eight minutes, and some 180 emergency workers were deployed to deal with the fire. Also, there were 17 people injured, mostly emergency workers. The press conference started very late. It’s under way now. The Minister of Health was just speaking in Arabic. We understand he said 13 children were killed in the fire today, along with 4 teachers and two Civil Defense workers. That’s a total of 19 deaths. We’re at National Central Command waiting for the Ministry of Interior to share more details about what happened at Villaggio today. Public will be updated on details of the press conference through our facebook and twitter pages. UPDATE | 3:51pm: We spoke with a mom whose child attends Gympanzee. She is at the hospital attending to children who were at Villaggio during the fire. She said 12 children have been confirmed dead, though not all necessarily from Gympanzee. Parents who are looking for their kids should go to Hamad’s Women’s Hospital Emergency Room. Still no details but it’s looking more likely that a number of people were either injured or killed in today’s fire at Villaggio. 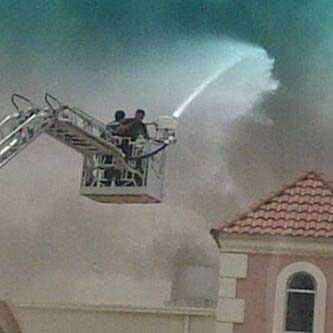 The concerned authorities are taking toll of human casualties and material losses at Villaggio fire. All the details will be updated. A press conference is being convened today evening to explain about the human casualties, other losses and causes of fire at Villaggio. At least two photos have started circulating on Twitter that people claim depict deaths from the fire. Hamad Medical Corporation says they cannot comment at the moment, but will release a statement later. Witnesses standing outside the mall say it hasn’t been completely evacuated, and that people are still being brought out of the building. @QatarToday an here too. Yes ppl still inside. All these being brought out now seem to be cops or security guards. #VillaggioFire not the end of it. Smoke outside the building, meanwhile, is apparently dissipating. Although the fire has apparently been quelled, still not a good idea to head to the Villaggio area. Police detours and traffic jams are reported on Al Waab Street. @dohanews RT @DohaBen: @katiebakesx there’s a road block at the torch lights and ambulances are still going to the scene. Rumors also abound on Twitter that varying numbers of people were killed in the fire. Officials have so far said this is untrue. Fire has been controlled initially. Firefighters and other concerned security persons are trying to remove smoke and cool the place. Cooperate with Police to convey only the facts. Two hours into the fire, it still does not appear to be contained. Firefighters and other security personnel are working to contain the fire at Villagio. 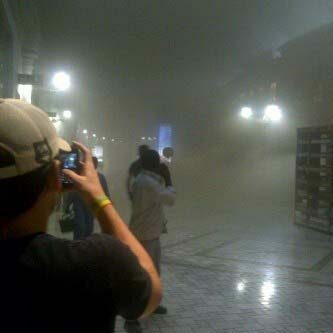 They have already evacuated all persons in the mall. #VillagioFire Firefighters have reached the main source of fire at Villagio and surrounded the area with all means to extinguish fire. So far, one person has been transferred to Hamad Hospital for medical treatment, but his condition is unknown, an HMC representative told Doha News. 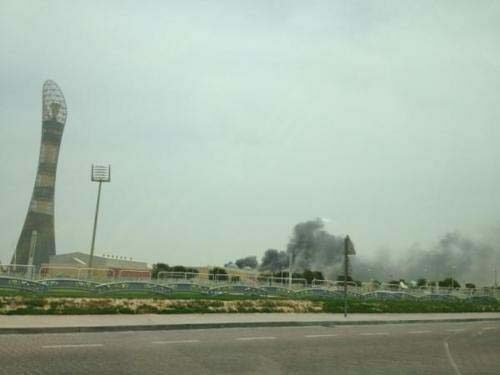 Initial reports from the Ministry of Interior (MOI) say the fire began at Gate 3, and witnesses told Doha News that the Nike store and the Go Sport shop were seen on fire. No serious injuries or deaths have been reported, but MOI is treating some at the scene for smoke inhalation. 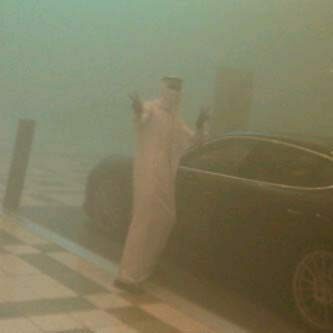 @dohanews Ahem, reporting live from Ground Zero. The fire isn’t as big as it seems. In fact the alarms are off. 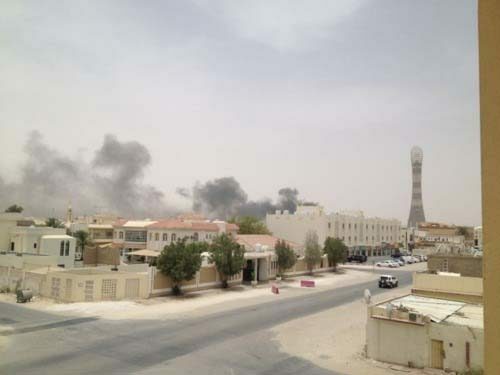 @dohanews Fire is getting larger. @dohanews huge traffic, police diverting traffic away from area. I was with kids in bowling and I was told nothing to worry about.